This is a Scottish delicacy available from most butchers in Scotland. 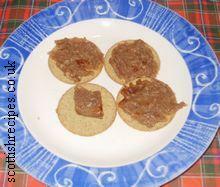 It can easily be made from home with the easy to cook recipe for potted hough further below. The word hough is the Scots name for shin and it is usually made in a small dish to give individual or family portions. 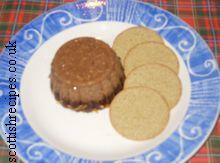 It is usually eaten cold and served on oatcakes, bread, toast, etc or like us - eaten straight out of the wee pot! 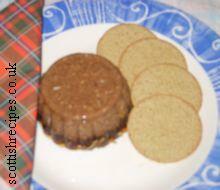 It is not the healthiest of Scottish recipes. Ingredients for potted hough include gelatine made from the bones of the beef from which the collagen forms and any meat from the beef. It is high in fat and is included here for historical interest and goes some way to explain the high incidence of heart disease in Scotland! Yet we know this and still enjoy eating it. If we pass a butchers we have to pop in for some as a wee snack though it mostly makes a hearty meal. Other names for potted hough include potted heid, potted haugh and pottit heid. Heid is the Scots word for head and pottit heid means the head of the cow. In England the equivalent dish would be English Brawn though that is made with pork rather than beef. It is thought that it originates from Glasgow. 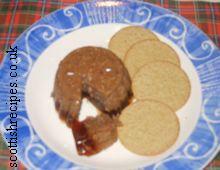 This potted meat recipe should be made into small individual moulds. The ingredients are easily bought from most butchers in Scotland, though they will also sell a ready made potted meat which is even easier to buy and eat! One piece of meaty shin bone, ie the beef hough that you should ask the butcher to crack. One bay leaf, a wee pinch of cayenne, ground spice and salt and pepper. Place the ingredients into a large pan and cover with water. Bring to the boil and then simmer for about four to six hours. Sieve the liquid into a separate pan and keep the bone, meat and gelatin in the original pan. Set aside to cool down and then skim off the fat from the surface. 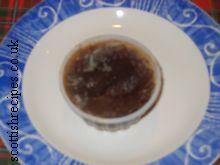 Mince, shred or chop the mixture as finely as possible then return to the drained liquid, ie the stock. Some chefs like to add more seasoning of salt and pepper at this stage of cooking. Boil for a further quarter of an hour. Place into each mould and place in the fridge to chill. 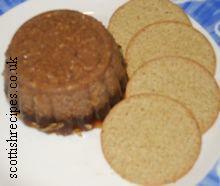 Serve the potted hough with oatcakes, on hot toast or your favourite bread. The book Scots Cooking: The Best Traditional and Contemporary Scottish Recipes by Sue Lawrence recommends eating it with salad or bread and remembers her mother serving it to the family in summer with new potatoes and vegetables such as cabbage or turnips. The Book Maw Broon's Cookbook has another traditional Scottish potted head recipe which suggests adding some allspice berries, mace blade and peppercorns to bring out the flavour of the beef. Buy Maw Broon's Cookbook at a discounted price and with free delivery available. There is a potted hough recipe in the National Trust for Scotland book The Scottish Kitchen by Christopher Trotter which uses a whole leek, carrot and stalk of celery.